Copious amounts of marijuana, fistfuls of Prozac, sleeping in cars, and a pedal bike; you’d think this was a story of a down-and-out Tour de France hopeful, but the case could not be further from reality. Nor is it a story of a self-pity blown degenerate waiting for life’s hand-outs to come within grasping distance. This is a story of one man’s quest to find out what he wants to be when he grows up; a task often more difficult than one thinks, and Jeff Block ‘s testimony is sure to lay claim to this statement. This single quote, which commences the book, sets the reader up for what is expected to be an off-the-wall, witty reflection of a journey to the soup line; but, that is not what is contained in this 191-page paperback. Instead, Jeff Block takes his readers on a path of hardship, failure, and disappointment. There is nothing humourous about suicidal thoughts, and this is just one of the hardships faced by a man with a university degree, a daughter, and a heap of debt the size of a year’s harvest of roses pilled and burnt in Times Square. From a floor trader in Chicago’s financial district to driving a limousine, to menial desk jobs, all the way to whirling seemingly pointless cocktail napkin roses in bars, Jeff Block can honestly say he has been there and done that. Searching, seeking, scouring for that perfect job is not a course that comes equipped with a user manual, but with the author’s “I refuse to work for anyone again,” attitude and a bounty of ambition the perfect job came to him, turning out to be a hobby he claims to have put on steroids. 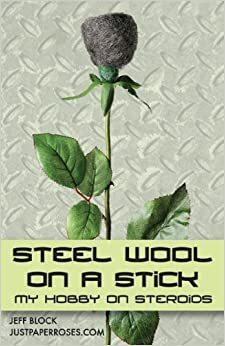 “Steel Wool on a Stick” is a loose handbook for self-starters, entrepreneurs, or anyone dying to have a career where they can honestly say, “I love my job.” Unlike many, Jeff Block has found his calling, his niche, his “dream job”. JUSTPAPERROSES.COM is his company and also the premise of the book. An Internet-based company created by a passion, Jeff Block is now making a healthy living, working from home, doing what he loves. His attitude, “If I can do it, you can do it,” is not original, and the contents of these pages are not a step-by-step instruction booklet on how to become rich and famous; it is a story of persistence, dedication to one’s passions, and the will to never give up. “Life is like a roll of toilet paper. The closer you get to the end, the faster it goes.” This true-life quote closes the book and opens the eyes of anyone who reads it. Do you one day want a Corvette in your garage?